The trial of Rear Admiral Shigematsu Sakaibara, commander of Wake Island at its surrender in September 1945, convened at the U. S. Naval Air Base on Kwajalein Island in the Marshalls on December 21, 1945. Two other defendants, Lieutenant Commander Shoichi Tachibana and Lieutenant Toraji Ito, were also to stand trial before the military commission for offenses on Wake Island. The crime of the Imperial Japanese Navy officers: execution of nearly one hundred American prisoners of war on Wake. Three months earlier, when Wake was formally surrendered and turned over to the Americans, U. S. Marines and a few journalists stepped ashore to see the ruins and what was left of the severely debilitated Japanese garrison. When asked if there were American graves on the island, the Japanese led them to an area with two common graves and one bearing the name Will Miles. The rock-mounded graves bearing large crosses “showed signs of very recent attention: newly trimmed bushes and posts, still tacky with fresh paint, surrounded the burial area.” (Building for War, 304) At the end of the war, one hundred American POWs were still unaccounted for and the sad likelihood was that here lay their final resting place. But when did they die; how did they die? Investigators arriving a few weeks later to conduct the U. S. Strategic Bombing Survey and the new U. S. commander, Captain Earl A. Junghans, all got the same explanation from the Japanese officers who remained on Wake: during a devastating U. S. carrier-based attack on Wake October 6-7, 1943, half of the prisoners had perished in a direct hit on their bomb shelter. The remainder rose up in revolt under the cover of darkness, killing a guard and stealing two rifles, put up a fight, and were pursued to the north beach near the channel. Refusing to surrender, they were cut down. As the days went by, Junghans had remaining Japanese troops questioned about their participation in this “attempted escape” of prisoners and suspicions began to point toward Sakaibara and fifteen of his officers and men. 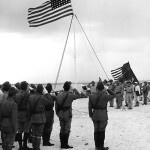 On November 5, 1945, the sixteen men were shipped to Kwajalein. En route, two of the men who had admitted participation and incriminated the others, committed suicide. Documents of War Crimes trial proceedings provided by Floyd Forsberg, son of one of the 98, and Wes Injerd, who manages and builds the excellent online resource, Center for Research: Allied POWs under the Japanese reveal the truth. Sakaibara, Tachibana, and Ito all confessed to lying about the fate of the 98 on Wake. The story of bombing casualties and suppressed revolt on Wake, initiated by Sakaibara just before surrender and pressed upon his subordinates, crumbled. Of the 98 remaining American contractors held prisoner on Japanese-occupied Wake, one (named Jack in the proceedings) was apprehended in about July 1943 stealing food from the headquarters company’s food stores. Previously warned of severe punishment for such theft and “in order to maintain military discipline it was necessary that the man be executed.” A formal statement was read in translation to the accused and Lieutenant (jg) Nonaka executed the prisoner on Peale by decapitation. Just after sundown on October 7, 1943, following the devastating U. S. carrier-based raid that killed some three hundred defenders and incurred massive damage on Wake, Admiral Sakaibara issued the order to “shoot to death the prisoners of war on the northern shore.” Tachibana recalled being startled at the sudden order, but knew that the commanding officer would have carefully considered this conclusion and did not doubt that it was “justifiable to execute the prisoners of war according to the situation that night.” With fleet intelligence warnings and the size and impact of the American raid, the Japanese expected an imminent invasion and Sakaibara reasoned that the prisoners were likely to aid their countrymen. Lieutenant Ito’s confession is recorded in the trial documents. Ito stated that he had arrived from Kwajalein by plane about 5:30 PM on October 7, 1943, and was assigned as commanding officer of headquarters company, relieving Lt. Cdr. Tachibana. Ito’s first order, passed to him by Lieutenant Tachibana, was that “headquarters company was ordered to shoot the prisoners of war to death.” Ito proceeded to the northern beach where he “saw the prisoners of war sitting side by side in a single file facing the beach, with their hands tied and blindfolded. About five or six meters behind each of them stood the riflemen. There were about one hundred but I couldn’t see the men in the right flank distinctly. A platoon leader came up to me and said that everything was all set. So I said, ‘Go ahead as ordered.’” When it was over, he ordered the platoon leader to report to headquarters. At Kwajalein Lieutenant Ito is said to have committed suicide in prison after his confession and before the verdict. The Japanese buried the executed prisoners in a tank trap on the north beach of Wake, but about a week later, an American who had escaped the carnage was captured near the food stores. Still under heightened alert and “in order to suppress any danger arising from him,” Sakaibara personally decapitated the man on Peale. A quick disinterment and body count on the north beach confirmed that there were no more survivors. Only after news of Japan’s surrender in August 1945 did the commander order the hasty removal of the remains to a more respectable grave site with neatly piled rocks, a cross, and a freshly painted fence. It is likely this haste – and the commander’s distraction with fabricating a diversionary story – resulted in an incomplete disinterment of what had been on the dark, far right flank of Ito’s firing squad. These remains, discovered on the north beach of Wake Island in 2011, are the subject of the JPAC mission. Lieutenant Ito took his own life; Lt. Cdr. Tachibana’s death sentence was commuted to life in prison. On Guam in June 1947, Rear Admiral Shigematsu Sakaibara, was “hanged by the neck until dead” for his war crime: responsibility for the execution of 98 American civilian POWs on Wake Island.